Womenswear designer, Doo.Ri is in great company with the likes of Karl Lagerfeld, Giambattista Valli and Matthew Williamson by launching her own Impulse collection at Macy's. Her affordable collection will be available on February 15th in 185 Macy's stores and on Macys.com. I caught up with Doo.Ri at the preview today and she was all too nice to answer a few questions about her Impulse Collection. 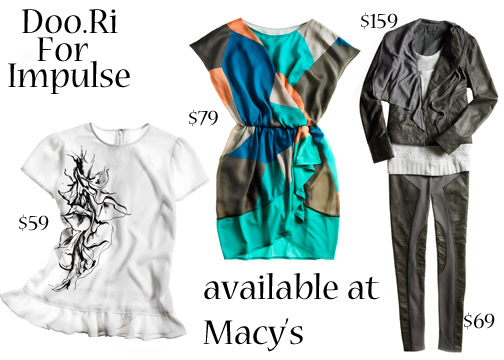 What was the inspiration for this Impulse collection at Macy's? I was really inspired by my studio, I wanted to bring my home of New York and often times what I'm inspired by which is Art and bold graphic prints. What do you think your usual customer will take away from this collection? I really didn't want to there to be any distinction to what I bring to my own line versus what I bring to Macy's. My line it's really about elegant, jersey and all of those pieces I wanted to use for Macy's as well. How did you feel about designing for a lower price point? I'm all about the democratization of clothing. I love great design at an affordable price. If I can get my price point lower that would be great. Would you collaborate with Macy's again? I had so much fun! Everything is in the realm of possibility. They really made this such an easy and fun process for me.